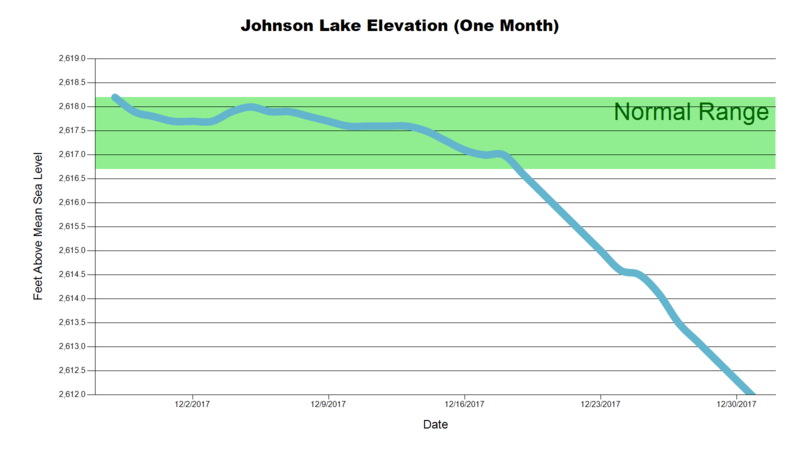 Archive by category "Johnson Lake"
Central decided to take advantage of the low water levels at Johnson Lake and do some shoreline maintenance work. 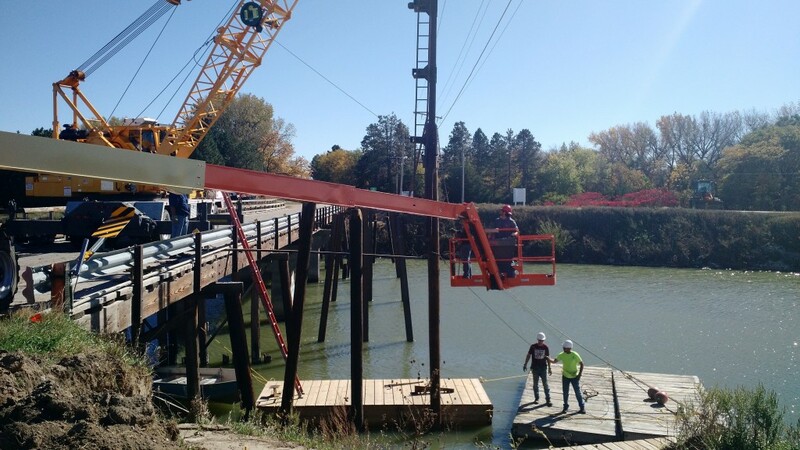 As the Nebraska Game and Parks Commission worked to complete their Angler Access Project near the inlet at Johnson Lake, the water levels remained around eight feet lower than normal through most of October. 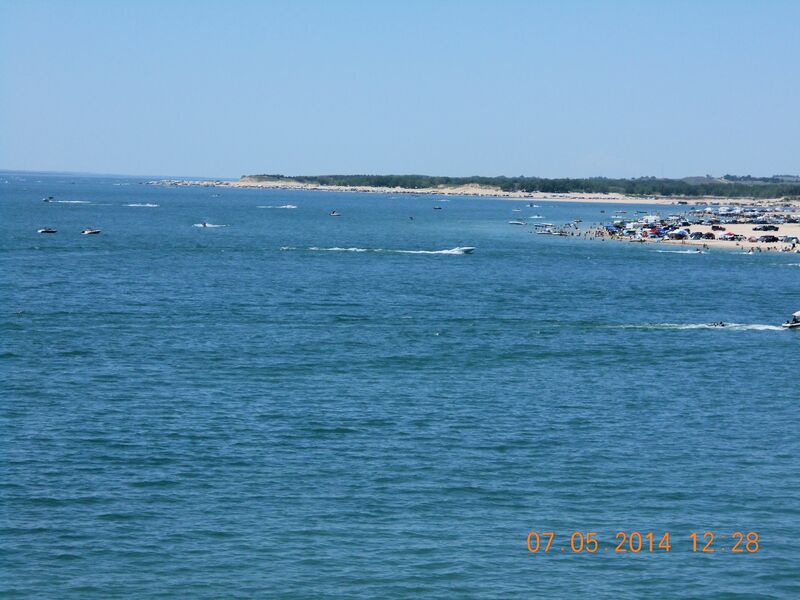 This drawdown allowed cabin owners to clean up shoreline areas and also allowed Central to do some shoreline work. 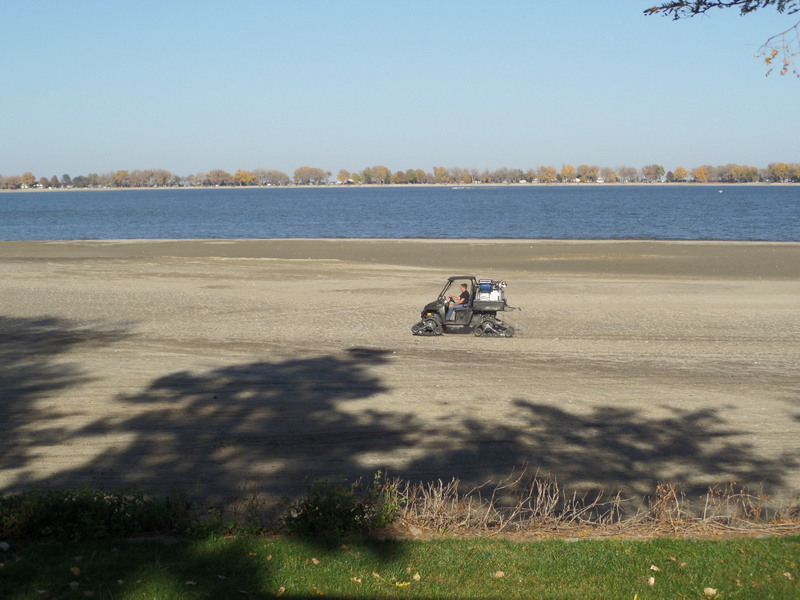 Kent Aden uses his personal utility vehicle to spray an aquatic herbicide on the shoreline at Johnson Lake. 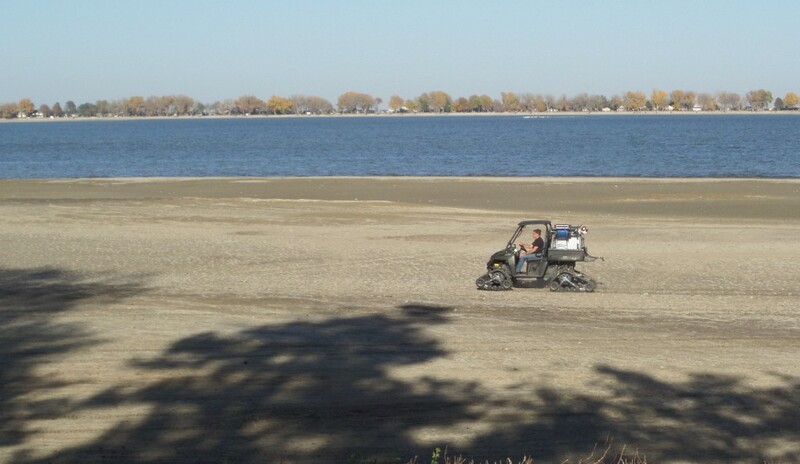 Kent Aden is shown here testing a new aquatic herbicide in attempt to control the sago pondweed, which has been a concern for many lake residents. 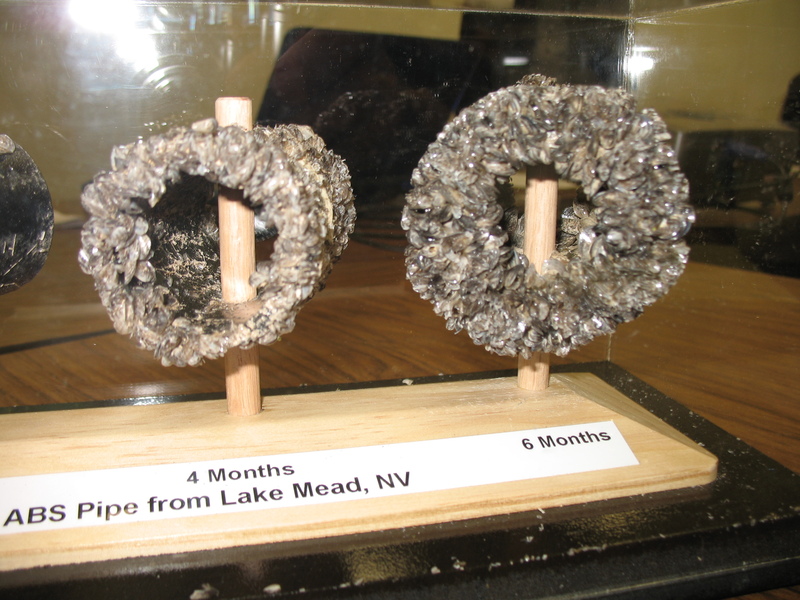 According to the USDA website, the sago pondweed plant is beneficial for wildlife and erosion control, but can become overgrown, and should be controlled in lakes commonly used for recreation and irrigation¹. 1. Sago Pondweed Fact Sheet. Retrieved from: http://plants.usda.gov/factsheet/pdf/fs_stpe15.pdf. 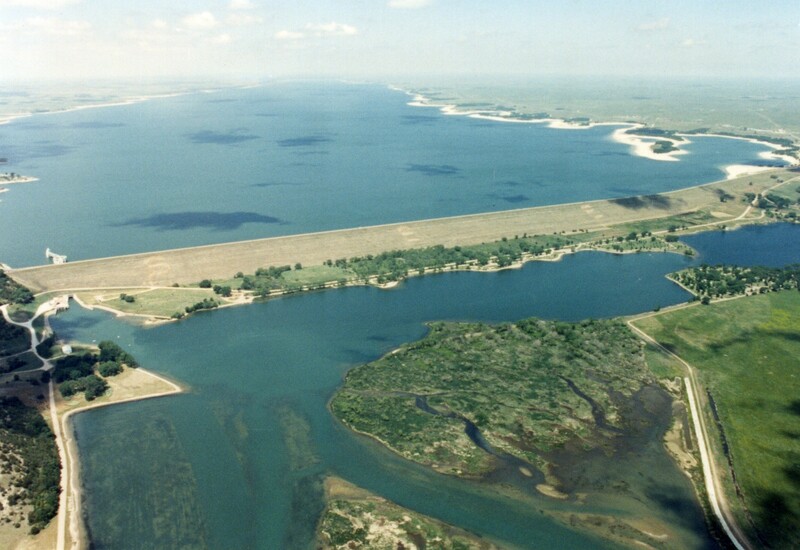 The combination of almost perfect weather and a three-day weekend – not to mention the inviting water and beaches of Lake McConaughy – produced a record number of visitors to Central’s storage reservoir over the Fourth of July weekend. 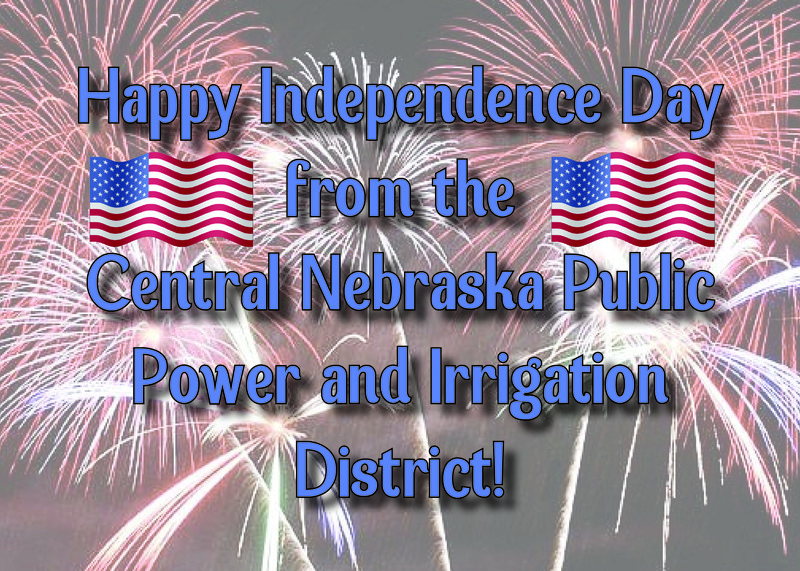 The Nebraska Game and Parks Commission reported that 181,147 visitor-days were recorded for the July 4-6 weekend. The previous record was 142,446 in 2010 when July 4 fell on a Sunday. A visitor-day is one person per day, so if a person stayed for three days, that would result in a count of three visitor-days. 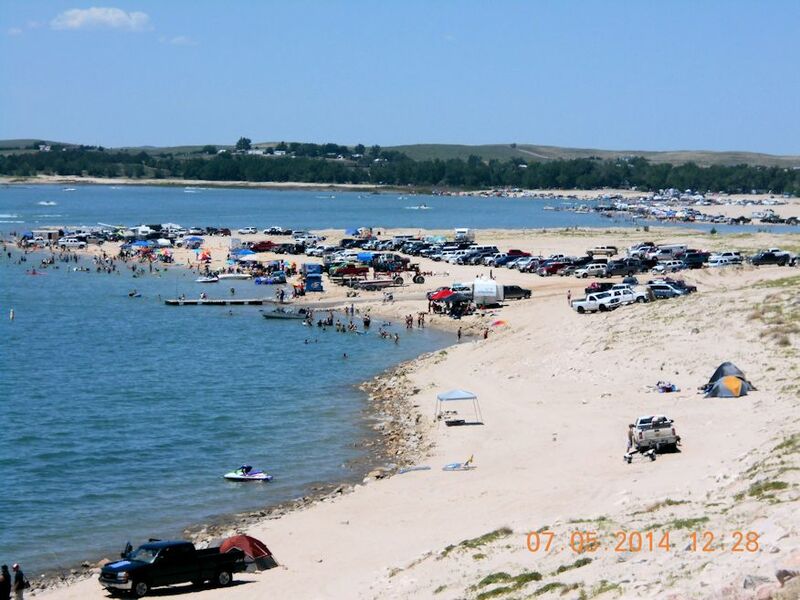 Using those figures, an average of more than 60,000 people were at the Lake McConaughy/Lake Ogallala recreation areas each day. The NGPC reported that all 325 camping pads in their modern campground were occupied. 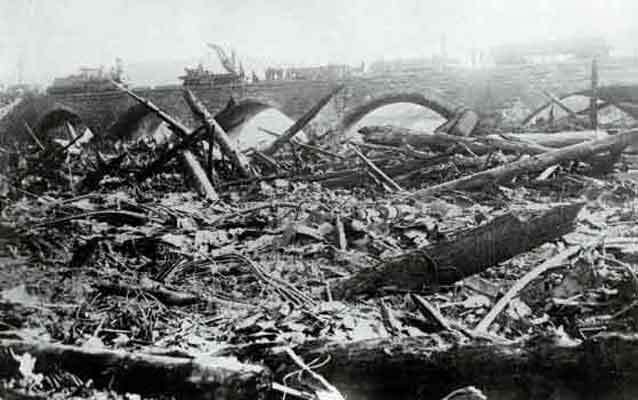 Nate Nielsen, Central’s foreman at Kingsley Dam, reported that the beaches and shorelines were lined with campers and tents, in some places four and five rows deep. 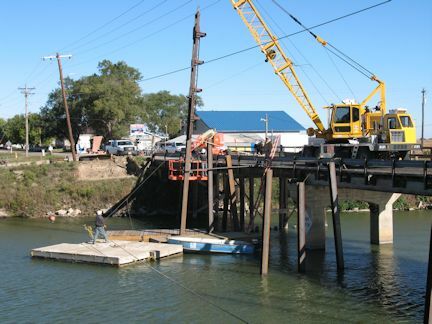 The Keith County News reported that businesses catering to lake visitors, including restaurants and convenience stores, were busy throughout the weekend with large, steady crowds of customers. 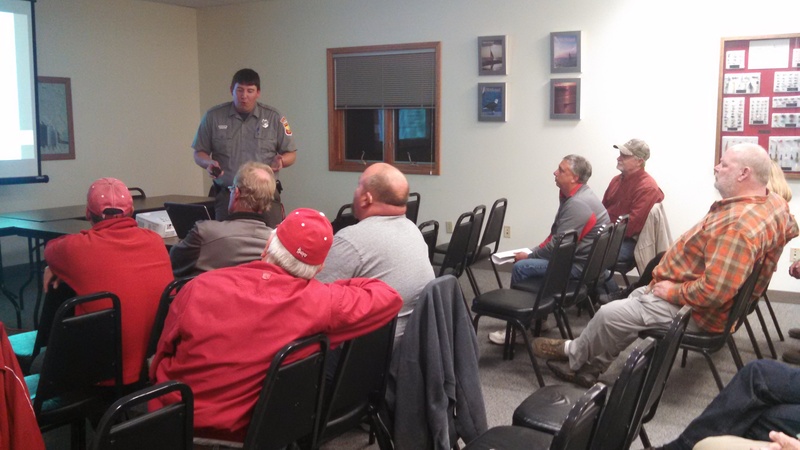 Law enforcement officials reported no serious problems, although the local sheriff’s office, the State Patrol and fire and rescue crews were extraordinarily busy responding to various emergencies, accidents, traffic issues, incidents, and complaints. All in all, though, a family-friendly atmosphere predominated and fun, recreation and relaxation ruled the weekend. 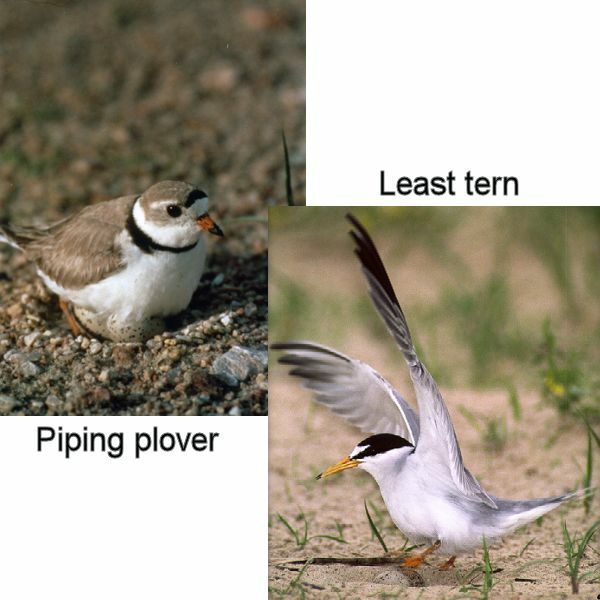 Nielsen also reported that the crowds of people did an excellent job of avoiding tern and plover nesting areas. Central personnel helped patrol the areas and reported no incidents of nest disturbances. Johnson Lake near Lexington also drew large crowds. Larry Ossenkop, clerk of the Sanitation Improvement District at the lake, used water usage figures to provide an estimate of about 6,500 people at the homes, cabins and campgrounds over the weekend. Water levels were favorable, the weather was near perfect (although Sunday’s temperatures rose to somewhat steamy levels) and the lake was busy with watercraft of all shapes and sizes. 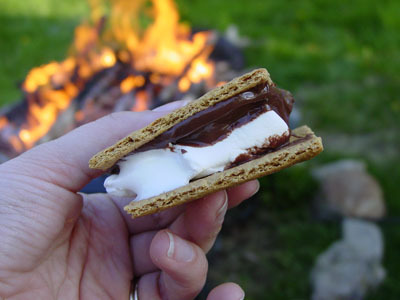 Fourth of July is a holiday many spend celebrating at the lake. This year, Johnson Lake events are being held on Saturday, July 5th. The day will begin with the annual boat parade 10:00 a.m. at LakeShore Marina boat docks. 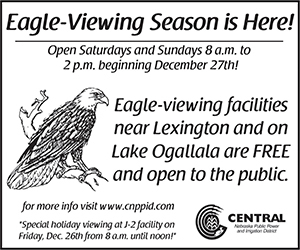 Sign up at LakeShore Marina C-Store from 8:00 am to 10:00 am. Immediately following the boat parade prizes will be given out. 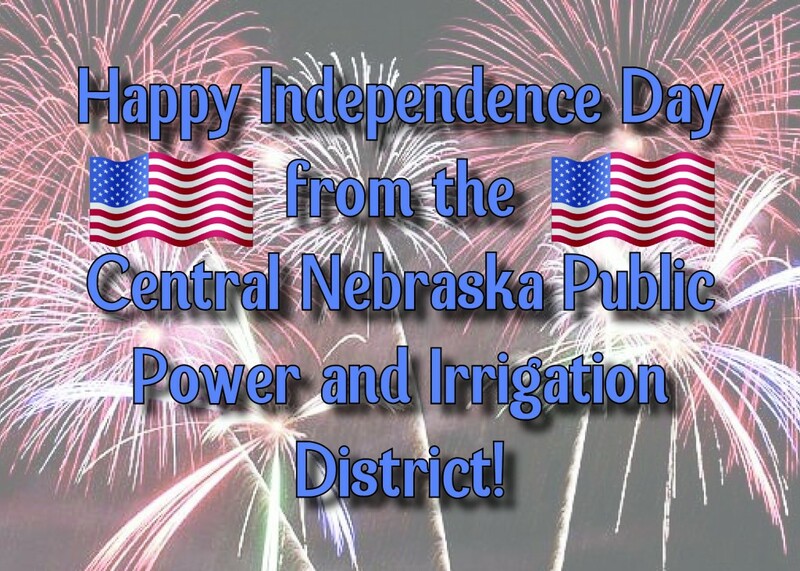 There will also be a dock decorating contest on July 5th. Sign-up at LakeShore Marina from 8 a.m. – 12 p.m. Judging will take place in the afternoon from 2 to 4 p.m. with cash prizes. The night will conclude with a wonderful fireworks show on the lake. As always, please use safety precautions when boating or participating in other lake activities at any lake this weekend.